Nikon clearly wants to make amends for its unspectacular J2 launch late last summer: it's launching not one but two 1 series models that provide a stronger incentive to go Nikon among lower-end mirrorless cameras. The 14.2-megapixel J3 and 10.1-megapixel S1 mostly receive hand-me-down features from the semi-pro V2, although that's not necessarily a bad thing. The leftovers give them uncommonly accurate 73-point autofocusing and an upgraded Expeed 3A processor that can handle 15FPS burst photography with continuous focus -- three times the frame rate of the J2 in the same conditions. Apart from their resolution, the main separators between the J3 and S1 are the J3's inclusion of a simple panorama mode and a slightly wider ISO range for the S1, which starts at ISO 100 versus the J3's 160. Both new bodies ship in February, when the S1 will lower the 1 system's entry price to $500 with an 11-27.5mm lens, and the J3 will have a suitably in-between price of $600 with 10-30mm optics. The shooters will soon be joined by new lenses and accessories, as well. A 6.7-13mm (18-35mm equivalent), f/3.5-5.6 wide-angle lens and a 10-100mm (27-270mm equivalent) f/4-5.6 telephoto zoom don't have definitive release dates, but should respectively cost $500 and $550. Scuba divers who want a J3 or S1 for their excursions will also get a WP-N2 underwater case in February, albeit at a $750 price that's more expensive than the cameras themselves. Las Vegas, CES Booth #8643 (January 7, 2013) – Today, Nikon Inc. announced the new Nikon 1 J3 and Nikon 1 S1, the latest additions to the ever growing Nikon 1 Advanced Camera with Interchangeable Lens System. Designed for consumers looking for a camera that offers the compact size and portability of a point-and-shoot camera along with advanced controls and features found in high-end digital cameras, the new J3 and S1 cameras offer enhanced speed and performance, high image quality and new easy-to-use creative shooting modes. Furthermore, users will be able to easily share and transfer images to smart devices instantly when connected to the optional WU-1b Wireless Mobile Adapter1. "With today's announcement of the Nikon 1 J3, Nikon 1 S1, 1 NIKKOR VR 6.7-13mm lens and 1 NIKKOR VR 10-100mm lens, Nikon continues to demonstrate our commitment to developing and expanding the Nikon 1 System for creative shooters looking to step up from their compact digital cameras," said Bo Kajiwara, Vice President of Marketing, Planning and Customer Experience, Nikon Inc. "Similar to previous Nikon 1 System cameras, the compact yet powerful J3 and S1 offer stunning image quality, quick performance, incredibly fast shooting speeds, user-friendly modes and controls, as well as the ability to wirelessly share and transfer images when paired with the WU-1b Wireless Mobile Adapter." Though new additions to the Nikon 1 System, both the J3 and S1 feature many proven and trusted Nikon technologies commonly found in other Nikon camera models. 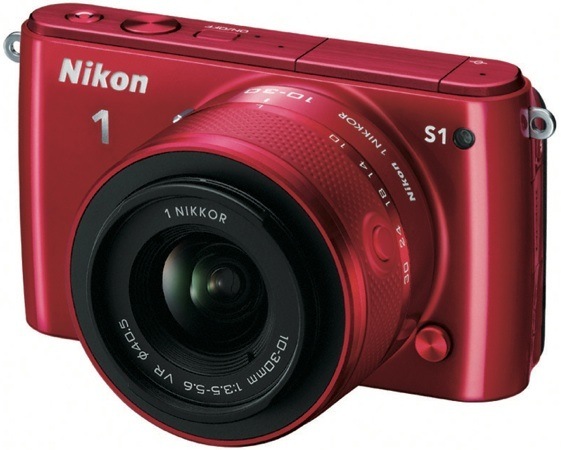 The Nikon 1 J3 features a 14.2-megapixel CX-format CMOS sensor, while the Nikon 1 S1 sports a 10.1-megapixel CX-format CMOS sensor. Paired together with Nikon's powerful EXPEED 3A image processing engine, these CMOS sensors deliver stunning high-quality images and HD video even in challenging lighting situations with rich detail. For complete shooting versatility, both cameras feature a wide ISO range, from 160 to 6400 in the J3 and 100 to 6400 in the S1, allowing users even more freedom and capabilities when capturing content in low-light situations. Both cameras offer wide and bright 3-inch LCD screens as well as a new integrated flash that can be setup to go off automatically or can be manually popped up based on a shooter's desired results. Additionally, the Nikon 1 J3 and Nikon 1 S1 offer Nikon's Advanced Hybrid Autofocus (AF) system, which is lightning fast and highly responsive, ideal for capturing life's split second moments. With this rapid AF system, users can take advantage of incredibly fast shooting speeds, allowing them to capture fast action that is sharp and in clear focus. The cameras also feature a 73-point AF array that helps ensure accuracy and super precise focus even when capturing fast moving subjects throughout the frame. Further, the Nikon 1 J3 and Nikon 1 S1 include the world's shortest release time at approximately 80 milliseconds*, and the world's fastest high-speed continuous shooting** at 15 frames-per-second with continuous AF. With Best Moment Capture Mode, Nikon 1 J3 and Nikon 1 S1 shooters can explore the benefits of two dynamic features, Slow View and Smart Photo Selector. In Slow View, the pressing of the shutter button halfway down once focus is achieved will allow users to capture live action (approx. 1.33 seconds), while the view of the subject is displayed at five times slower than normal speed (approx. 6.66 seconds) on the camera's LCD screen. Furthermore, the slowed-down view is looped over and over until a full-press of the shutter is made. By viewing action slowed down, users have more opportunities to capture the perfect moment. When Smart Photo Selector is used, shooters can capture up to 20 shots with the J3 and 15 shots with the S1 with one press of the shutter button. The cameras will then automatically identify the five best images to keep based on exposure, focus and facial recognition factors. Like the Nikon 1 V2, the Nikon 1 J3 and Nikon 1 S1 were designed to work with Nikon's optional WU-1b Wireless Mobile Adapter. When the WU-1b is connected to the J3 or S1, users have the ability to capture high-quality images and can then easily transfer them wirelessly to a smart device. Once transferred, images can be shared with family and friends or posted to status pages on social media networks. If using the free Wireless Mobile Adapter Utility application for Android™2 platform smart devices as well as iPhone® and iPad®3 mobile digital devices, J3 and S1 users will have the ability to remotely take photos with the camera from a smartphone or tablet. 1The Wireless Mobile Adapter Utility Application must be installed on the smart device before it can be used with the WU-1b Wireless Mobile Adapter connected to the Nikon 1 J3 and Nikon 1 S1. The application can be downloaded free of charge from Google Play™ or the Apple App Store. For use with Android or iOS mobile devices, please refer to mobile device compatibility and available features at https://play.google.com/store/apps/details?id=com.nikon.wu.wmau&hl=en (Android) or https://itunes.apple.com/en/app/wireless-mobile-adapter-utility/id554157010 (iOS). 3iPhone, iPad and iTunes are trademarks of Apple Inc., registered in the U.S. and other countries. *Among digital cameras with interchangeable lenses available as of December 20, 2012 as determined by Nikon performance tests; measured when using the single-point AF mode and the shortest focal length of 1 NIKKOR VR 10-30mm f/3.5-5.6 (according to research conducted by Nikon Corporation). **Among digital cameras with interchangeable lenses available as of December 20, 2012 (according to research conducted by Nikon Corporation). ***SRP (Suggested Retail Price) listed only as a suggestion. Actual prices are set by dealers and are subject to change at any time. ****Specifications, equipment and release dates are subject to change without any notice or obligation on the part of the manufacturer.